Share the post "Sacred Seams"
Aromelia Jaen twirls through the living room of her tiny concrete home in the farming community of Carriazo, Panama. She’s wearing a bountiful flowered floor-length skirt and a matching top, and her neck is adorned with strand upon strand of gold jewelry. Caribbean folk music plays from a cassette tape player in the corner of the room, guiding Jaen as she spins this way and that, beaming, holding onto the sides of her skirt as she sashays. 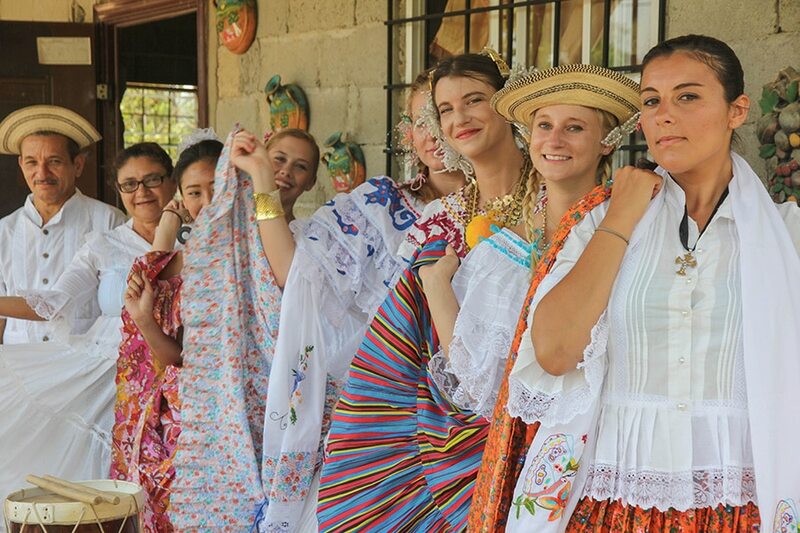 Jaen’s clothing is known as pollera, a traditional Panamanian style of dress that dates back as early as the 1500s (“it’s as old as Panama itself!” Jaen explains). Worn by old and young, rich and poor, throughout every region of the country, pollera is as much a symbol of Panama as the canal and the golden frog. The outfits, which involve a petticoat, a long skirt and a blouse, piles of necklaces and bracelets and a beaded headpiece known as a peineton, are usually reserved for special occasions: weddings, quinceaneras, festivals. “Some women even choose to be buried in their pollera,” Jaen says. Jaen, who frequently leads pollera-themed dance workshops at Kalu Yala events, sews her own outfits and sells them throughout the county. A table in her living room is stacked high with embroidered fabrics and spools of lace, which she’ll use to make her intricate creations by hand. She shows off her various necklaces, explaining that each one symbolizes something different. The fish charm signifies an abundance of food, “la bruja” stands for magic, a rectangular bead is meant for women to clean underneath their fingernails. Each of Panama’s ten provinces has a distinct style of pollera — in Colon, for example, the clothing is more reserved, while the Los Santos region is known for a more ornate style. Jaen says that the fancier polleras can fetch up to $10,000; cheaper fabrics can be purchased for as little as $40. The price isn’t what matters.